You may have erased the mask beyond the edges of the egret. This means that part of the background is included in the selection. Now you'll return to Quick Mask mode and restore the mask to those edge areas by painting with black. 1 Click the Quick Mask Mode button (to return to Quick Mask mode. 2 To make the foreground color black, select the Switch Foreground and Background Colors icon (above the foreground and background color-selection boxes. Make sure that the black color box now appears on top. Remember that in the image window, painting with black will add to the red overlay. 3 Choose a brush from the Brush pop-up palette. Select a small brush from the first row of brushes, because you'll be refining the edges of the selection. 4 Now paint with black to restore the mask (the red overlay) to any of the background area that is still unprotected. Continue working until only the area inside the egret remains unmasked and you are completely satisfied with your mask selection. Remember that you can zoom in and out as you work. You can also switch back and forth between Standard mode and Quick Mask mode. Note: In Quick Mask mode, you can also use the eraser tool to remove any excess selection. 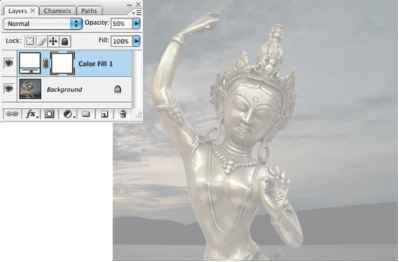 * For a color illustration of painting in Quick Mask mode, see figure 6-2 in the color section. 5 In the toolbox, switch to Standard mode to view your final egret selection. 6 Double-click the hand tool ( ) to make the egret image fit in the window.